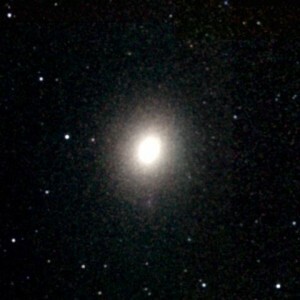 Messier 32 (M32), also known as Le Gentil, is a dwarf elliptical galaxy located in Andromeda constellation. The galaxy lies at a distance of 2.49 million light years from Earth and has an apparent magnitude of 8.08. 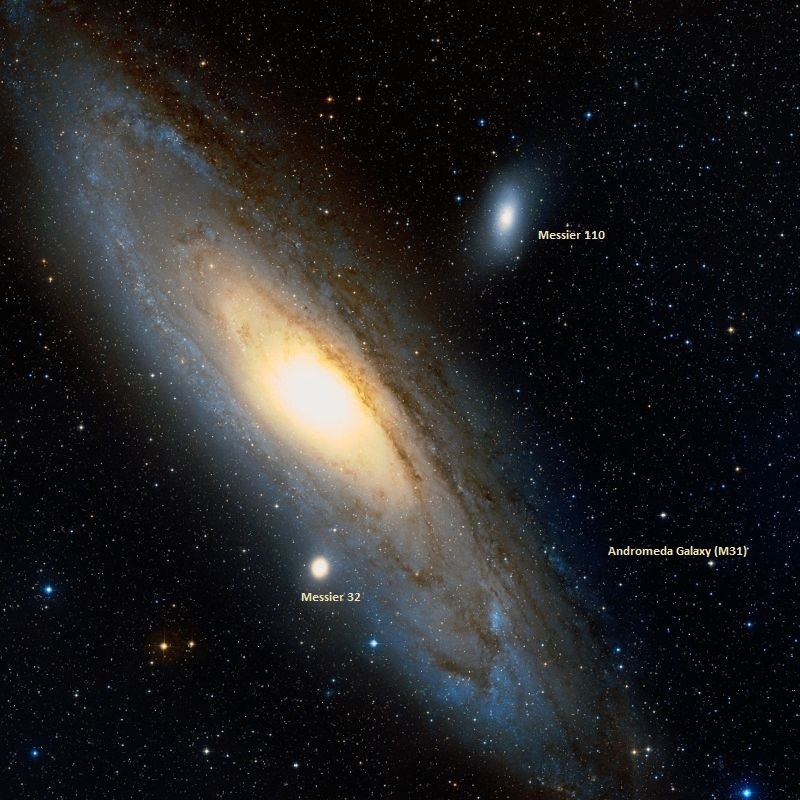 M32 is a satellite galaxy of M31, the famous Andromeda Galaxy. It has the designation NGC 221 in the New General Catalogue. Messier 32 was named after Guillaume Le Gentil, the French astronomer who discovered it in 1749. The dwarf galaxy spans only 6,500 light years at its widest point and occupies an area 8.7 by 6.5 arc minutes in size in the sky. Le Gentil can be seen in binoculars and appears like a hazy patch of light. In small telescopes, it looks like a diffuse ball of light with a bright core, surrounded by a small halo. 8-inch telescopes will reveal the galaxy’s oval shape, but even larger instruments will not show much detail because M32 is very small, especially when compared to M31. Messier 32 is a member of the Local Group of galaxies, which also includes the Andromeda Galaxy (M31), the Triangulum Galaxy (M33) and the Milky Way among others. 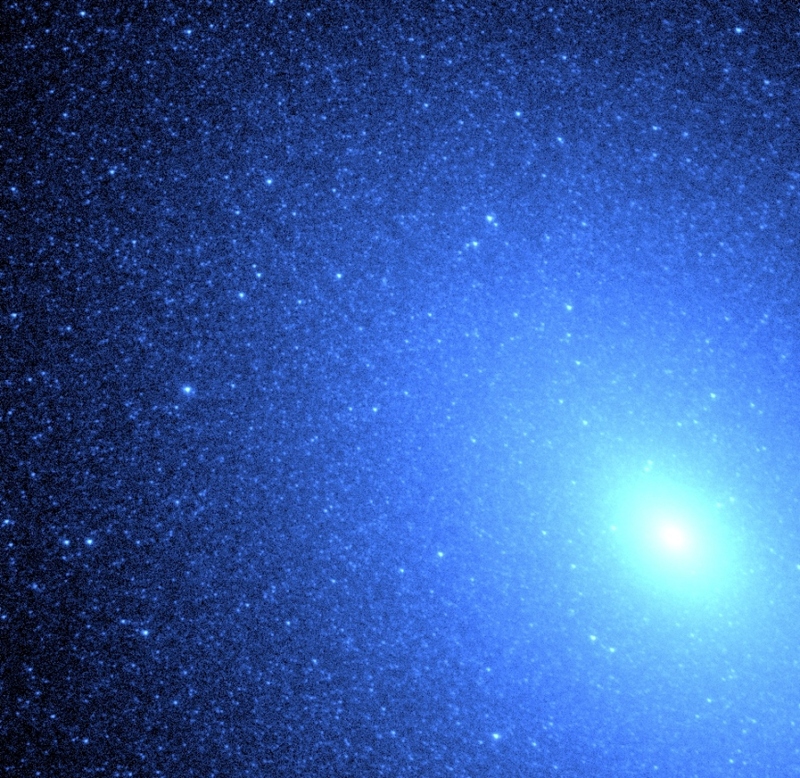 It was the first elliptical galaxy to be discovered. Messier 32 is easy to find as it appears right next to the Andromeda Galaxy. It can be found by first locating the Great Square of Pegasus, formed by three stars that belong to Pegasus constellation and Alpheratz, Alpha Andromedae. Alpheratz marks the northeastern corner of the square, the one facing Cassiopeia‘s famous W shape. With an apparent magnitude of 2.1, it is the brightest of the four stars. Going northeast of Alpheratz and looking under the W asterism, the three bright stars of Andromeda constellation are easy to spot: Delta Andromedae lies about 7 degrees from Alpheratz, Mirach (Beta Andromedae) is a further 8 degrees away, and Almach (Gamma Andromedae) is the third bright star along the same line and the closest one to Cassiopeia. 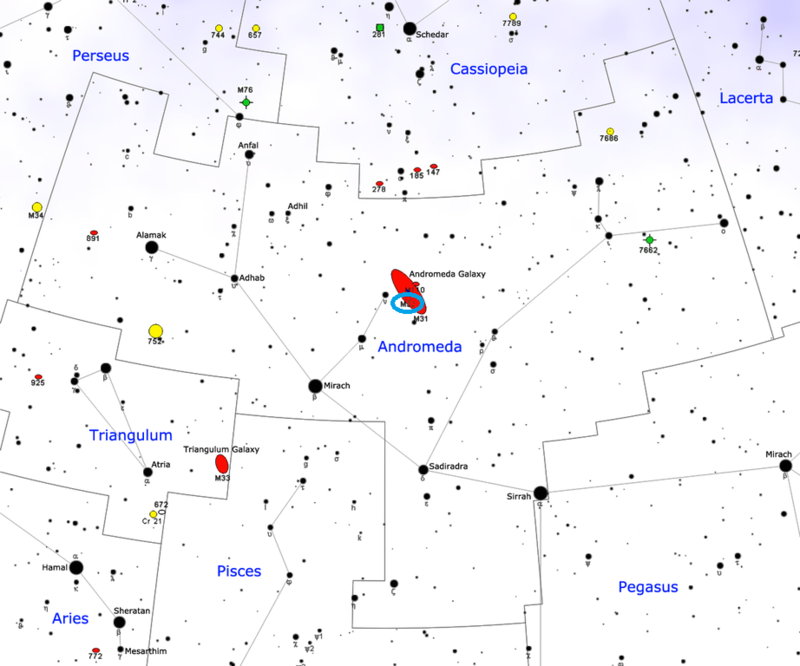 The Andromeda Galaxy and Le Gentil can be found 8 degrees to the northwest of the middle star, Mirach. Le Gentil lies 22 arc minutes south of Andromeda‘s centre. It appears superimposed on Andromeda‘s outer spiral arm and is believed to be closer to us than that particular portion of the larger galaxy. (Even though Andromeda is usually listed as some 110,000 light years more distant than M32, it is still uncertain which of the two galaxies is closer to us.) The best time of year to observe M32 from northern latitudes is in the months of October, November and December. Le Gentil contains almost no gas or dust and shows no evidence of any current star forming activity, but there are indications that star formation took place in the galaxy in the past. Like other elliptical galaxies, M32 is home to mostly old red and yellow stars. Hubble Space Telescope’s exquisite resolution has allowed astronomers to resolve, for the first time, hot blue stars deep inside an elliptical galaxy. The swarm of nearly 8,000 blue stars resembles a blizzard of snowflakes near the core (lower right) of the neighboring galaxy M32, located 2.5 million light-years away in the constellation Andromeda. Hubble confirms that the ultraviolet light comes from a population of extremely hot helium-burning stars at a late stage in their lives. Unlike the Sun, which burns hydrogen into helium, these old stars exhausted their central hydrogen long ago, and now burn helium into heavier elements. The observations, taken in October 1998, were made with the camera mode of the Space Telescope Imaging Spectrograph (STIS) in ultraviolet light. The STIS field of view is only a small portion of the entire galaxy, which is 20 times wider on the sky. For reference, the full moon is 70 times wider than the STIS field-of-view. The bright center of the galaxy was placed on the right side of the image, allowing fainter stars to be seen on the left side of the image. Image: NASA and Thomas M. Brown, Charles W. Bowers, Randy A. Kimble, Allen V. Sweigart (NASA Goddard Space Flight Center) and Henry C. Ferguson (Space Telescope Science Institute). Messier 32 has a linear diameter of 6,550 by 5,000 light years and a total mass of about 3 billion solar masses. It is approaching us at 205 km/s. The galaxy’s overall spectral class is G3. The galaxy contains a supermassive black hole at its centre. The mass of the black hole is estimated to be in the range from 1.5 and 5 million solar masses. 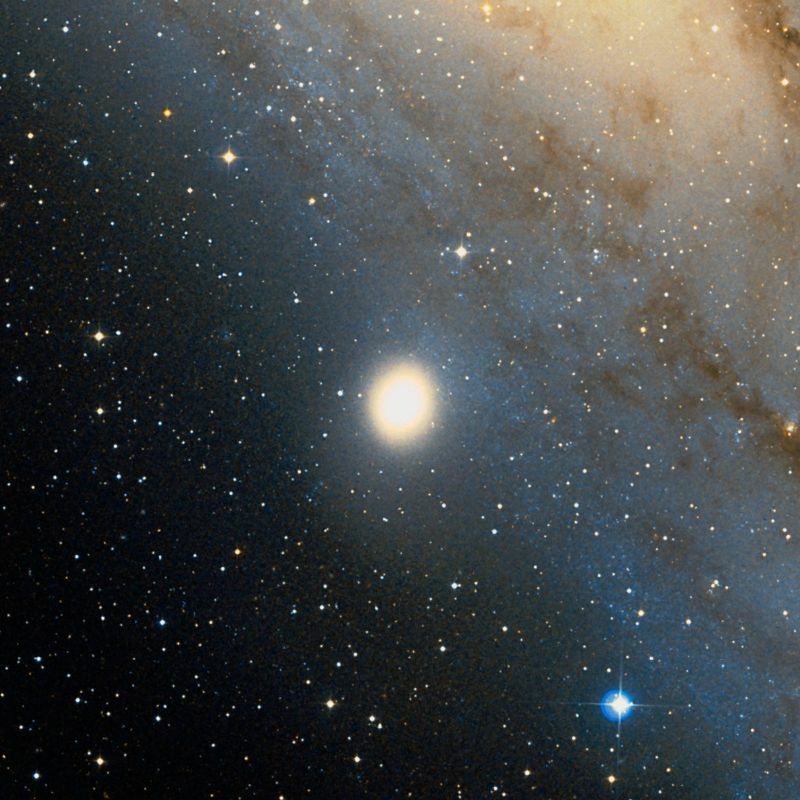 Messier 32 is one of Andromeda Galaxy‘s 14 known satellite galaxies and one of the two brightest ones. The other bright dwarf elliptical galaxy, Messier 110, is more distant. Both galaxies were first resolved by the German astronomer Walter Baade in 1944. Baade used the 100-inch telescope at the Mount Wilson Observatory in Los Angeles. Le Gentil (Messier 32). Atlas Image mosaic obtained as part of the Two Micron All Sky Survey (2MASS), a joint project of the University of Massachusetts and the Infrared Processing and Analysis Center/California Institute of Technology, funded by the National Aeronautics and Space Administration and the National Science Foundation. Messier 32 is a prototype for a class of galaxies known as compact ellipticals. It is believed to have once been a spiral galaxy, but as a result of interaction with the much larger Andromeda, its spiral arms were ripped off by the tidal forces from M31 and its stars and globular clusters now reside in the larger galaxy’s halo. American astronomer Halton Arp included Le Gentil in his Atlas of Peculiar Galaxies (1966) as Arp 168. M32 is listed in the category of galaxies with diffuse counter-tails (tidal features caused by gravitational interactions with another galaxy). A nova was detected in M32 on August 31, 1998. It occurred about 28.5 arc seconds west and 44.7 arc seconds south of the galaxy’s centre and was discovered by a team of astronomers from the University of California at Berkeley, within the Lick Observatory Supernova Search Program. The nova reached a visual magnitude of 16.5. I have examined in the same night [August 3 to 4, 1764], & with the same instruments, the small nebula which is below & at some [arc] minutes from that in the girdle of Andromeda [Messier 31]. M. le Gentil discovered it on October 29, 1749. I saw it for the first time in 1757. When I examined the former, I did not know previously of the discovery which had been made by M. Le Gentil, although he had published it in the second volume of the Memoires de Savans érangers, page 137. Here is what I found written in my journal of 1764. That small nebula is round & may have a diameter of 2 minutes of arc: between that small nebula & that in the girdle of Andromeda one sees two small telescopic stars. In 1757, I made a drawing of that nebula, together with the old one, & I have not found and change at each time I have reviewed it: One sees with difficulty that nebula with an ordinary [non-achromatic] refractor of three feet & a half; its light is fainter than that of the old one, & it doesn’t contain any star. At the passage of that new nebula through the Meridian, comparing it with the star Gamma Andromedae, I have determined its position in right ascension as 7d 27′ 32″, & its declination as 38d 45′ 34″ north.